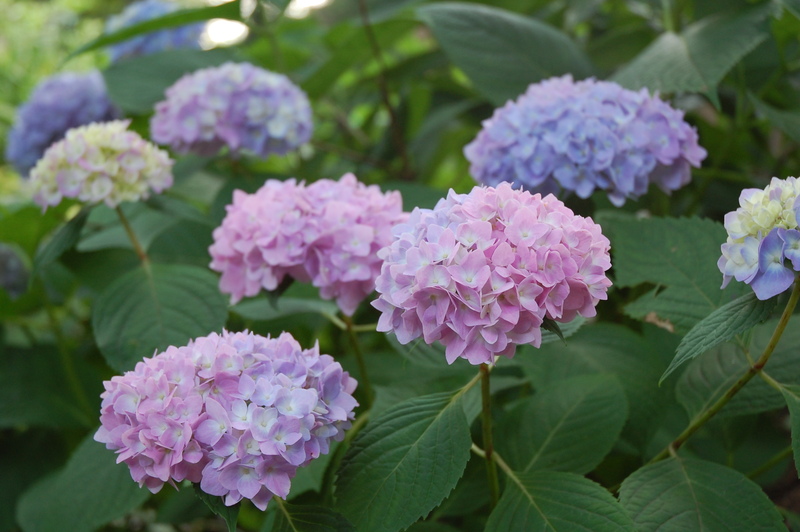 Now the heat arrives, and with it, the glory of the hydrangeas! Now every gardener starts to need to water water water to keep their newest plants happy. Now is a great time to invest in a rain barrel, available from garden supply catalogs, to catch your rain water for use in summer watering. Many gardeners also find that an important step in saving water is to apply a nice layer of organic mulch 1-2 inches deep. This keeps the sun from drying out the soil, keeping your plants’ roots cool and moist. You can buy fancy bark and shredded mulch by the bag or by the yard from any nursery. Other options include chipped leaves or wood chips, easier to come by at bargain prices. These mulches also help with another common June problem for gardeners: weeds! Spreading mulch keeps weed seeds from germinating. You can also stop those weeds by pulling them when they’re little, before their roots get very deep. Use a small hand rake or trowel to loosen the soil so you get their roots. Staying on top of the weeding is really much easier than waiting until they’ve taken over. Check out our page of photos and descriptions of summer-growing weeds if you’re not sure what to look for. Don’t forget to keep an eye on those gutters and other potential mosquito breeding sites. Check to make sure your gutters are draining well. Extra points for reminding your neighbors to do the same! Mosquito larvae can mature in as few as 7 days, so empty out your bird bath at least every 5 days. Other breeding sites are tarps and tires, sand box toys, trays under planters, any place where even a teaspoon of water can stand for 7 days. Keep an eye out, and remind your neighbors. It can make a real difference in keeping the mosquito populations lower through the summer. Read more here. Now that summer is here, it’s a great time to plant some annuals for summer color. 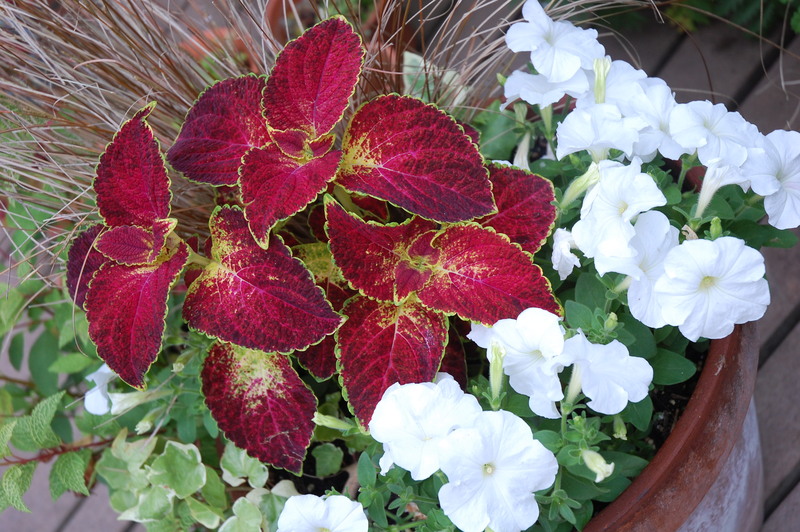 In addition to flowers, consider foliage plants like coleus (pictured here in red), sweet potato vine, and grasses that add texture and color all summer long. June is the height of the growing season. If you want to fertilize shrubs and flowers that need a boost, now is a good time. Organic fertilizers like Holly Tone and Flower Tone are best, breaking down slowly so as not to burn your plants, and least likely to run off unused into our precious Chesapeake Bay. Other tasks in June include: cutting off spent iris stems, moving the tomato cages from the peonies to the baby tomatoes, pinching back your mums by cutting off the tips every time they grow 6-8 inches to promote bushy growth (continue until July 4th and then stop so they can develop their flower buds for autumn bloom), and staking growing vines like clematis, passion vine, and mooflower. Don’t forget to sit back and sip some lemonade while you survey the beautiful results of all your gardening labors!